When I left Niki about a month ago, I took home a (new) pair of her shoes. 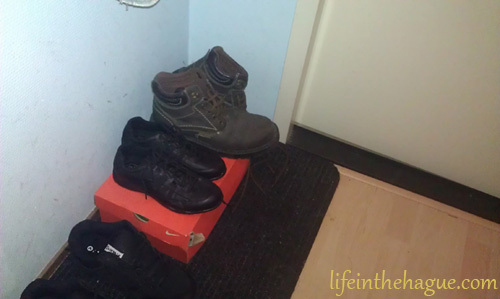 Yesterday, it amused me to put the shoes next to mine. And chuckle at how small her shoes and feet are compared to the huge vessels that are my shoes… But why is this do news worthy? Well I’ve already told about how I’m making room at my place..
Oh, just fyi.. that last comment was meant as a joke. I am sure Marco does not need any help keeping the place clean..
Well he does need Niki to sort his dvds and comics, thats for sure..
That one spot is the single place in my apartment that is usually clear of random debris. Out of place sure, but has helped me out a few times already so i support the placement.